I first came here on a glorious spring day, the Saturday of Easter week 2003. I was cycling through the narrow, lost lanes of north Suffolk between Redgrave and Hepworth. This is a distance of some five miles, but I didn't see a single car, or even another human being, apart from a man walking a huge dog in the fields by Hinderclay. The lanes forked and joined meaninglessly; or, at least, without meaning for the 21st century. In years gone by, they must have connected long-forgotten hamlets, and separated strips of now-enclosed land. What we see today is merely an echo of what George Ewart Evans called the pattern under the plough. All around me, across the fields and on the horizon, were churches. Some had bold, square towers rising above the trees; others were gleaming flint shells, huddled in distant hedgerows. Some were old friends that I recognised and greeted: Hinderclay, Thelnetham, Market Weston and Hopton. Others were across the Norfolk border, mysterious and remote. Once, I heard a clock striking midday across the green barley. I resisted their enticements, and forged on. But I was filled with a sense of continuity. In these burgeoning spring fields, there was still beating a heart of old; the unforgotten rhythm of Christianity, as it was when these were built as Catholic churches, and as it is now in the care of gentle Anglican faith communities. The churches seemed to pin the land down, stabilising and guarding it, embracing and healing the lives led around them. It was a reassuring image in Easter week. 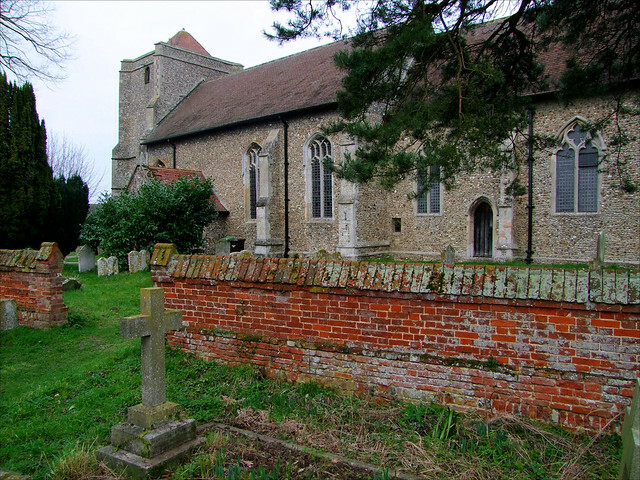 St Peter sits in a tight, raised churchyard on the edge of the village. Its appearance is a little curious, and there are a couple of good reasons for this. The tower was shortened because it was unstable in 1677 - you can see the date on the western side. The metal banding is an early 19th century attempt to stop it collapsing completely. But the event that really shaped the current St Peter happened in 1898 - Sam Mortlock tells us it was on Easter Monday. On that day, the thatched church as it was then was almost completely destroyed by fire. J.S. Corder of Ipswich was chosen for the rebuilding; his is the extraordinary Gothick tower at Swilland, but here he was conventional, probably because he knew that the Society for the Protection of Ancient Buildings were looking over his shoulder. Except, perhaps, for the most curious feature of St Peter. It is right at the top of the stubby tower. Up here, there is a little pyramid, as at Bromeswell. But this one has a delightful dormer window in it, facing west. You can only see it from the road, the parapet hides it close up. I fantasized that there might be a little room up there, with someone living in it. Corder liked dormer windows in towers, and the one at Swilland is exotic, to say the least. On the occasion of my first visit I was disappointed to find Hepworth church locked without a keyholder notice, but times have changed, and today there are three friendly keyholders who are not only happy but enthusiastic for you to see inside. You step into a pleasant late Victorian nave, and how could it be anything else, given the circumstances. But the church is not without its medieval survivals, and the best of them is the most intriguing font cover in Suffolk. It dates from the 15th Century, and appears to have originally been telescopic, although it was altered later to have opening doors. It is reminscent of the one at Ufford, though not as tall, and the paint was removed in the 18th century, but it is remarkable in that so many of the figures have survived (the ones at Ufford at 19th and 20th century replacements). There are two ranges - the upper range consists of niches, and the figures have gone. But the lower range consists of a landscape of castles and battlements - you see the backs of small, naked people going in through small doorways, and emerging as knights from larger doorways, sword in hand, to do battle with the world, the flesh and the devil. I guess it is meant to represent the power of baptism. There is a 19th century cross clumsily added to the pinnacle. It survived the fire, which I couldn't help thinking would look rather suspicious to the insurance company if it happened today. The font it sits on is late Victorian. Everything is spick and span. The nave is neatly benched, and there is a decent turn of the 21st Century window by Bronwen Gordon depicting four scenes, including the manna in the desert and its New Testament echo, those who hope in the Lord. Nearby are several memorials to the Methwold family of Hepworth Hall, one a beautiful yet sad Art Nouveau brass to two children, John Robert Tindall, beloved infant son of Henry Tindal Methwold and Sybil Mary his wife... and of their darling child Margaret Consuelo... Both children died under the age of two, three years apart. The pulpit was apparently the 1920s work of Sir Henry Methwold. Another Methwold memorial in the chancel is a good example of the late Victorian and Edwardian enthusiasm for depicting real people in Biblical scenes. It is a window by Powell & Sons which shows the two Marys meeting the angel at the empty tomb, but the Virgin Mary is represented by the figure of Mary Ellen Methwold, who died in 1902. The scallop shells on her head dress appear on the other Methwold memorials. In general, the chancel is a fine example of early 20th century High Church solemnity, still retaining Art Nouveau cross and candlesticks and a choice red carpet. A brass memorial to Anthony Radice, Rector here for 25 years through the sixties and seventies, is a simple, Latin reminder of quite how High Church Hepworth must once have been. There is a sweetly arched low-side window not unlike the one at Stanningfield, but this one is neatly glazed. Back in the nave, a curious feature is the set of handbells suspended on a rod across the tower arch. They were given to the Parish in the 1920s, but unfortunately they are no longer in use. Simon Jenkins observed that the parish churches of England are the largest folk museum in the world, and Hepworth church feels at once the heart of a living faith community and a touchstone to the life of its past, and who could ask for more from a parish church?